The term linguabridity, formed from linguistics (language) and hybridity, is used here to refer to people (especially children) who grow up with two languages that belong to two, often competing or conflicting, cultures. It entails much more complex procedures than just bilinguals' and multilinguals' ability to switch forth and back several languages. First of all, it deals with identity creation (and not identity concealment as often happens with bilinguals) and the adoption of (extra)linguistic and cultural elements shared within the in-group one, by virtue of birth and/or educational background, finds himself in. Linguabridity is not limited to bilingual or multilingual societies but also affects, and even exceedingly, immigrant children in monolingual societies, where they are brought up straddling the language of their parents - used predominantly at home and the language of the country - used in school and with neighbours. In some cases, the parents end up being unable to properly communicate with their children who must have acquired better competence in the new language and/or have in the course of more exposure to the new country and its language, lost competence in the parents’ language. However, it is the former case of linguabridity, i.e. in multilingual societies, that is of interest here. This paper seeks to give another reading to the bilingual and multilingual scene of Cameroon that has often been described as constituting people from defined and fixed linguistic identity backgrounds. The redefinition is based on a questionnaire administered to children and their parents in Yaounde in 2003 that sought to establish at what point the larger linguistic identity icons, Anglophones and Francophones, were valid to children brought up as French-English bilinguals. It was tested on children who were born either of totally Francophone parents or of mixed (Francophone and Anglophone) parents, but who were enrolled in English-medium schools. These children, as the results show are neither Anglophones nor Francophones. They are something else. They call themselves bilinguals pronounced [biliŋgwls]. From an iconic perspective, they are between the French identity, francophonism and the English identity, anglophonism - hence linguabrids. Linguabridity affects especially children and not adults. Adults are actually involved in a drama of identity opportunism (see Anchimbe: forthcoming) in which they adopt the features of the group they want to identify with or benefit from. Children on the other hand grow up being unable to acutely identify with one group or the other. They grow with the ability to switch but are not actually switching - rather they are expressing the identity that is theirs, the one they grow up with. Multilingual contexts, especially of postcolonial nature, comprise languages whose ancestries are different and opposing, and whose range of functions within these societies oblige members to build identity allegiances in certain ways that permit them to switch forth and back between them. Switching in this case, does not simply imply code switching from one language to another for communicative purposes but implies actually taking on, and projecting values and ethics identifiable with that particular language. This therefore encompasses language or linguistic ability on the one hand and sociological redefinition or reclassification on the other. The languages in these contexts, as said above, share limited affinity in terms of history. While the official languages (used for national administration, international cooperation and diplomacy) are foreign to these regions, the indigenous languages are native to them. Most postcolonial (African) countries have come to be named after these foreign but now official languages - e.g. Anglophone, Francophone or Lusophone countries. Besides, there is another set of languages used for wider communication - generally Pidgins and Creoles, which are the fruit of the contact with the other languages and of their speakers. In the case of Cameroon, two European languages (English and French) introduced during colonialism function as official languages over a complex framework of 270 living indigenous languages, several regional lingua francas, and a quasi-national Pidgin English. The multilingual landscape of this central African country was already complex before the coming of the colonialists. Being the melting pot of many peoples of Africa before the 18 th century (occasioned by the Arab invasions in the north, intertribal conflicts, search for fertile and less hostile lands, etc. ), Cameroon is inhabited by over 200 ethnic groups that speak a total of 270 living indigenous languages. There were initially 285 indigenous languages, of which four have unfortunately become extinct through the extinction of their speaker populations; and eleven more are highly endangered (Ethnologue 2001) due to the threat of the extinction of their speaker populations, a lack of functional necessity, urban migration, the empowerment of the official languages and the drift to languages of socio-economic importance. The existence of the over eight regional lingua francas, i.e. Fulfulde, Ewondo, Basa’a, Duala, Hausa, Wandala, Kanuri, and Arab Choa (see Breton and Fohtung 1991:20) dates far back before colonialism. The widespread Pidgin English, though often identified as a regional lingua franca, is actually spoken both in the English-speaking and French-speaking regions of the country. For more recent insights on the linguistic landscape of Cameroon see Breton and Fohtung (1991), Kouega (1999, 2002), Bird (2001), Echu (2003), Anchimbe (2005, 2006, forthcoming), Mforteh (2006), etc. From the general standpoint of the society, the explosive number of languages and the corresponding accommodations (communicative or integrative - opportunistic as well) speakers make for one another, affect their lives at various points. It has led to, among other individual discontentment, several complaints of sociolinguistic disadvantage by various groups of people. These complaints affect both the people’s interaction with others and their choice of identity in each situation of communication. The impact varies from region to region, depends on the degree of mixing of the population, and follows the trend of socio-political and economic (dis)advantage. It has led to several sociological imbalances within the country, for instance, between Anglophones and Francophones, the north and the south, the Muslims and the Christians (though limited), which have subsequently resulted in several social discontentments, such as the Anglophone problem, the southern Cameroon’s secession requests, the issue of the come-no-go in the South West Province, and the eleventh province diaspora. When there is a football match in France, the entire Cameroon nation is held to ransom by CRTV as the match is shown, sometimes live, on Cameroon Television. The Cameroon Radio and Television Corporation (CRTV) does not react in the same manner when a football or any other sporting encounter takes place in England or involves an English team. These few examples of social grievances induced by the unequal status of the languages of the country explain why people fluctuate in their linguistic identities and why many have indulged in security and convenience alliances. The problem of linguistic victimisation is therefore expressed clearly in these grievances, especially because the grievances are not addressed to the government or any other administrative structure but are rather levelled against members of the opposite linguistic group. If you take away my right to speak my own language by mandating another language [ ... ...], you pull me out of circulation, you take me out of the dialogue. (Kassahun Checole, qtd Omoniyi 2003:13). If we can’t decide on one Ghanaian language for the country after twenty-nine years of independence, why shouldn’t a foreign language be ‘butchered’ [ ... ...] The youth, like many other silent Ghanaians, is protesting against an imposed language which prevents him from expressing himself in his own tongue" (Kwasi Duodu 1986:3). I have to say I was profoundly shocked to see a Frenchman express himself in English at the [EU] Council table. That's why the French delegation and myself walked out rather than listen to that. (Jacques Chirac, interview 2006). Cameroonians, whether Anglophone or Francophone, have been victims or perpetrators of linguistic victimisation. Each group victimises speakers of the other(’s) language in a bid to prioritise their own language. Victimisation of this kind could be found in the ways Anglophones and Francophones refer to one another. Catchy offensive phrases like anglo, anglofou, anglofool and les anglos là used for the Anglophone Cameroonians and frog, francofou and francofool for the Francophones all point to the degree of victimisation to be encountered between these groups. It is therefore, not uncommon for civil servants in certain Francophone towns to summarily dismiss English-speaking interlocutors who require their services by simply saying "Je ne comprend pas l’Anglais" (I do not understand English) or those in Anglophone towns to say "I do not understand French" to force off French-speaking interlocutors. It is not altogether a matter of not understanding the other official language, but rather one of disregard for those who speak it, and who, as the case may be, are members of the other group opposed to one’s own. Although trends in the early 2000s show a sharp change in the perception of English by the Francophones in Cameroon (see Kouega 1999, Anchimbe 2005, Mforteh 2006), this unfortunately does not seem to represent a change in their attitude towards Anglophones. While it is clear that Francophone children now attend English-medium schools and Francophone students prefer pursuing degrees in English studies to French studies, it is far from true that their aim is to communicate with the Anglophones or to integrate with Anglophone circles. They are simply reacting to the worldwide current of English that seems irresistible " irrespective of how well-established and well-protected local cultures, languages and identities may otherwise be" (Fishman 1996:628). Their appeal to English is in no way, a reversal of the earlier political status quo nor a sign of subjugation to the model of English used by the Anglophones. This is because there is seemingly a redefinition of the variety of the language spoken by the Anglophones and that learnt by the Francophones. The Francophones, in a bid to preserve the esteem of their group and at the same time adapt to changes in the society, now liken the Anglophone variety of English to Pidgin English - the low-class language generally identified with non-literates. The variety they claim they learn and purport to speak is the advanced, international variety good enough for interaction with the rest of the world. This redefinition, as said earlier, is a power maintenance strategy, which does not necessarily reflect the facts on the ground. One major paradox that suggests its origin within the quest for societal power balance, is the fact that, English in Cameroon is taught exclusively by locally trained and predominantly Anglophone teachers. How the variety the Francophones learn from these same Anglophones is different from the one the Anglophones themselves learn and speak is mysteriously unclear. Their claim to a different and supposedly superior variety of English could only be convincingly explained by the desire to sustain their grip of power while adopting the language of the minority or marginalized group. Again, this corellates the linguistic identity tensions and the impacts they have on the individual and the society at large. The young children, who by necessity speak these two languages without knowing they have to fluctuate identities as the adults do, are therefore at the centre of these impacts, and as this paper shows constitute a prospective solution to the imbalance. In them the opposed linguistic identities might be finally levelled giving rise to a neutral identity built on bilingualism and the sharing of a common linguistic background. One main way by which communities counter linguistic victimisation is to strengthen in-group cohesion and improve on the public face of their language. To achieve this, the group presents itself as an entity strong enough to retaliate against the others’ victimisation through several methods, among them, similar linguistic victimisation of members of the other language group within regions or communication contexts dominated by the group’s members or its language. On this basis, therefore, identities are built on languages, and although in-group members may at other levels be opposed to one another, the particular language they identify with serves as point of return when they feel threatened or victimised. Language, of course, is "an attribute of group membership, an important cue for ethnic categorisation, an emotional dimension of identity, [ ... ... and] a means of facilitating in-group cohesion" (Giles and Coupland 1991:96). Cameroonians, in their response to victimisation from various sources build identities on the languages they use. These identities as Anchimbe (forthcoming) explains are generally opportunistic and fluctuate according to the context of communication or interaction, the desire to conceal one’s identity, and the desire to benefit from opportunities offered by other languages. These goals have produced linguistic identities like: official language identities - represented by education, public employment, and politics; indigenous language identity - built basically on tribal belonging and ethnic peculiarity; and individual identity - characterised by social rank, foreign exposure and socio-political esteem. While the official language identity regroups the country into two main factions following the dual Anglo-French colonialism (1919-1960), the indigenous language identity is also strong. Ethnic entities are therefore also involved in subtle competitions, which however, are submerged when the official language identity is threatened. In any case, "ethnic groups which consider their language to be of crucial importance [ ... ...] bolster and enhance their social identity by accentuating their language - that is for striving for positive ethnolinguistic distinction" (Hogg and Abrams 1988:57). These identities also play dominant roles in the definition of children’s linguabridity since their exposure to given languages is controlled, as in the case of the Status Mother Tongue children presented by Alobwede (1998), by their parents. This exposure to, and dream of, using these languages abroad fuels their quest for Pride Foreign Tongues (Anchimbe 2004). They, (un)fortunately, as opposed to the adults, do not wield the power of choice. They are the linguabrids themselves and do not pretend to be. The terms linguabridity and identity opportunism (see Anchimbe forthcoming) deal both with the construction of identities on languages and the patterns through which these identities affect speakers’ lives. Even though the concepts they represent deal with various types of bilinguals in multilingual settings, they are however very different. Whereas linguabridity affects people brought up between two linguistic and cultural identities, identity opportunism is practised by people who use their knowledge of, and performance in, several languages to benefit from the advantages these languages and their groups of speakers offer. This major distinction is necessary to understand the situation in which the children surveyed here find themselves. The desire to succeed in multilingual and multiethnic societies is often determined by the ability to switch to languages or social groups that provide socio-economic survival. Language survival and death, of course, depends exceedingly on the choices speakers make as to what language to shift to for economic purposes. Under such circumstances, speakers adopt new languages and accept the identities of these languages consciously since they want to survive through them. However, they occasionally shift back to their original language and its identity in other social interactions. This conscious process of linguistic identity fluctuation is referred to here, just like in Anchimbe (forthcoming), as identity opportunism. Since it is a conscious procedure motivated by the desire to succeed in multiethnic and multicultural linguistic contexts, it is most easily identifiable among adults, and is realised according to the demands of particular contexts following three basic requirements: identity concealment, portrayal of unity in divergence, and construction of convenience or security groups. [...] in times of social and political upheavals in West [Anglophone] Cameroon, these people cross back to East [Francophone] Cameroon and will only return when there are signs that the upheavals have calmed down. Although "they are hybrids whose hybridised parts are rejected even by those who share many of their characteristics" (Anchimbe, forthcoming:228), the people of the so-called 11 th province have lost their belonging to a fixed group and now, like many other French-English bilinguals shift forth and back these identities for different reasons dictated by contextual requirements. This pattern of conscious and opportunistic fluctuation between identities and languages is different from what happens among children caught between the two national identities, Anglophone and Francophone. These children, switch between English and French, not so much in the opportunistic ways described above, but rather because they have no choice. They cannot clearly identify themselves either as Francophones or as Anglophones. They are referred to in this study as linguabrids. This is because their ability to use the two languages, not exclusively according to the contextual requirements as the adults, deprives them of the unique root identity language from which opportunism among adults springs. The concept of linguabridity goes beyond bilingualism and does not represent the simple alternative usage of two languages. It does not represent the opportunistic or fluctuative attachment to, and identification with, a group or language according to situational requirements. Of course, it involves bilinguals, but goes far beyond their use of two languages to include the definition of their social belonging. Although linguabrids are indeed bilingual, they are different from other bilinguals who use two languages without being directly affected by the identities attached to those languages. Linguabridity therefore concerns those bilinguals brought up astride two cultures (whether linguistic or tribal), which very often might be conflictual, yet none of which they can clearly claim belonging to. They are therefore hybrids by virtue of their cultural blend, since two cultures and languages fuse in them - either through their parents in the case of perfect-linguabrids or through education in the case of the semi-linguabrids (explained below). They are hence not only cultural hybrids but also linguistic hybrids - hence the term linguabridity, and portray an identity that is a fusion of the two cultural and linguistic backgrounds inherited from their parents and the educational system. As the present Cameroonian landscape seems to show, linguabridity could be best illustrated with children who grow up astride two cultures and languages. Detached from the normal group of children who are exposed to Pidgin English, the regional lingua francas, and the indigenous languages, most of the linguabrids surveyed for this paper, form a group of their own. They form a status mother tongue group (Alobwede 1998) that speaks no other language but the prestigious, educational official languages. In their homes, only the official languages English and/or French are spoken while the supposedly non-prestigious Pidgin and lingua francas and the primitive indigenous languages are banned. In school, education is carried out in English while French is taught as a subject, more or less as foreign or second official language. The children grow up to use these languages as native languages, and often without inheriting the sociolinguistic competition and conflict associated with them, which set speakers of the different languages at odds. Though at a later age, they may become aware of these disputes, it is often too late to return to one of the official language identities completely - and even impossible for the semi-linguabrid whose parents come from either official language. Two major types of linguabrids can be identified among children who find themselves in this category. A third type based on personal will is also noticeable. They are examined below. The first group includes children born to French-speaking parents but who for several reasons important to the parents are sent to English-medium schools. Most of these children attend English schools as young as four years. They speak French at home with their parents, who very often do not speak English. Of the 194 parents whose children attend English-medium schools surveyed, 25 could speak and understand English; 15 did not understand English at all; 52 could barely follow a talk in English; and the rest could only try to understand the language. But they nevertheless chose to send their children to an English-medium school. Children in this group, identify with the Francophone identity on grounds of their parents’ belonging. Their identification ends at this level because they are not exposed to the indigenous language on which the ethnic identity is built. They are not exposed to the general Francophone commonalities acquired from peers from other French-speaking regions or in the neighbourhood. They are restricted to an in-group that shares similar qualities, attends similar schools and speaks the same languages. They sometimes identify with the Anglophone identity through education and their knowledge of English. Since language is the major attribute that sets Anglophones and Francophones apart, they easily integrate both circles through the power of their linguistic choices. They however fall short of both official language identities because they are not trained to be sensitive to the subtle sociolinguistic details that differentiate between the two groups. They therefore end up being neither completely Francophone nor Anglophone. This group is referred to here as the semi-linguabrids for two main reasons. First, the two linguistic cultures represented by English and French do not actually clash in them all the time. The two seem to be at some point slightly separated given that most of the parents do not understand English. English is therefore transformed into a school symbol and French, commonly used at home, becomes the implicit first language of daily activities. Second, due to the strong regional identification of Anglophones and Francophones, they may be primarily referred to and treated as Francophones since both parents are of Francophone origin. By analogy to the 11 th province issue, it has become common knowledge that a Francophone remains a Francophone no matter how long he lives in an Anglophone region or how well he expresses himself in English. Simo Bobda and Mbangwana (1993:201) on this basis exclude from the Cameroon English norm " the speech of Francophone Cameroonians; [ ... ... who] may have a high command of English, but [ ... ...] are regarded as users of a performance variety and can hardly serve as a reference." Nevertheless, these children remain linguabrids since they themselves are not aware of these subtle distinctions between the Anglophones and the Francophones. They are unable to clearly partition people with whom they share the same languages into the strict cultural and linguistic identity groups represented by the terms Anglophones and Francophones. This is initially because they are brought up outside of these identities, are detached from the sensitivities of these identities, and attend English-medium schools where feelings of belonging to the opposite (Francophone) identity are levelled alongside Anglophone feelings. The second group involves children born to mixed (French-speaking and English-speaking) couples but who through the preferences of the parents attend English-medium schools. They speak French and English at home with each parent in patterns that differ from home to home. In certain cases, one of the official languages may be predominant at home for certain reasons. For example, if the father is Francophone, he, following the predominantly patriarchal lineage system in the country, would want the children to speak French in order to, at a later age integrate with their traditional origin. But because English seems to be the major language of international promise, even such Francophone fathers now encourage their children to speak English more frequently with their Anglophone mothers and their extended Anglophone families. Where the father is English-speaking, the acquisition of French is also encouraged to give the child a linguistic balance within the country. The choice of English-medium schools for the children, as with the semi-linguabrids, is guided by factors such as the procurement of international employment, the prestige of the English language, opportunity to learn English from the children, and prospects for education abroad for the children. These children often refer to themselves as Francophones because of their father’s or mother’s origin in this region. At other times, they imagine they are Anglophones because of their mother’s or father’s origin in the region and because of their English education. Further identification beyond the official languages is also difficult because they have been predominantly exposed only to these languages, and in the same closed groups as the semi-linguabrids. In essence, they are neither Anglophones nor Francophones because they are bilingual, and share in some obscure way both identities through their parents, and are indeed mixed. This group is referred to here as the perfect-linguabrids. They are perfect-linguabrids because, although societal pressure may come to bear on them to choose one official identity, they are actually unable to do so because by birth they straddle these identities. So the regional identification of Anglophones and Francophones falls short of exactly pinning them down to one particular official language identity. Although patriarchal lineage may come into play, and hence oblige them to lean to the father’s identity, this may only be temporal and may not be profound since the children do not grow up with the ideals of that particular identity. Moreover, both linguistic (French and English) cultures are in a constant clash in the children. These languages and the cultures they carry (further made specific by the detachment of these children) fuse in them, making them represent neither the mother’s nor the father’s origin. They use English in school and both French and English at home in varying degrees. The seemingly distinct situational usage of the languages common among semi-linguabrids is absent in them. To evaluate the rate at which linguabridity is spreading among children in urban centres in Cameroon, English-medium primary, nursery and secondary schools were surveyed. Children with either or one parent being Francophone are classified as Francophones while only those born to both Anglophone parents are classified as Anglophones. This classification is used here to facilitate analyses and should not be considered firm. As table 1 shows, many children of Francophone origin are enrolled in English schools not only in the predominantly French-speaking towns (like Yaoundé) but also in the English-speaking towns (like Bamenda). This, as opposed to the survey of 2003 (reported by Anchimbe 2005), is not limited to nursery and primary schools. In a recent survey by Mforteh (2006), Francophone children are also enrolled in English-medium secondary schools in the heart of the Anglophone part of the country and far away from the Francophone towns. It may also mean that the Francophone children who were sent to these primary schools several years ago (in 1998) have now completed primary education and can no more return to the French-medium schools. They only have to continue with English-medium education, best provided in the Anglophone towns. Although the number of Francophones in secondary schools seems rather low, it is expected to rise in the next few years in a degree commensurate to the stampede for the language by Francophones. With almost 29% of Form 1 students in Our Lady of Lourdes Secondary School Mankon (Bamenda) being Francophones, and with the ever-increasing prospects in English, the Francophones may someday outnumber the Anglophones in some of these secondary schools, as it is the case with some of the primary and nursery schools in table 1. 4.3 How do the parents consider their children? The question these children and their parents are unable to clearly answer is whether they (the children) are Anglophones or Francophones. This is perhaps because the several definitions of what makes one an Anglophone or Francophone have no provisions for people in the situation of these children. So, the parents are unable to say where they belong because these children do not fit into any of these - except only partially on the regional criterion. Since anglophonism and francophonism are sociolinguistic and cultural identity groups built on the use of French and English respectively, these children, bilingual in both languages (though not sharing the typical aspects of any of these groups), therefore belong elsewhere - unknown to the parents, but perhaps, as shown in 4.4, known to the children themselves. From the survey, 54.5% (106 parents) of the 194 parents readily accepted they would consider their children Anglophone since they studied in English. 45.5% (88) of them maintained that their children are, in spite of their English education, in every degree Francophone. If the questionnaire had ended here, it would have been safe to call these children Anglophones without regard for their parents’ regional origin. But in a further question that expected the parents to say if they would refer to their children in the same manner as Anglophones from the Anglophone region, the tendencies drastically changed. As table 2 shows, 75.5% (146) of the 194 parents categorically refused while only 24.5% (48) accepted they would consider their children equally like other Anglophones. Table 2 reports the reasons parents advanced for not likening their children to Anglophones from the English-speaking part of the country. The regional and cultural elements of the official language identity are mandatory to membership in them. Many of the 146 parents (i.e. 34%) define Anglophones and Francophones according to the geographical boundaries left behind by Anglo-French colonialism of the 19 th -20 th centuries. Others (26.5%) believe the regional and cultural elements fuse in the children - which supports the hypothesis that they are indeed hybrids, hence linguabrids. It is interesting to note that the instrumental motivation for learning English, which seems to be the major goal for adult learners of the language in Cameroon, is the least important reason why these children are not considered Anglophones - only 7.5% of the 146 parents say the children study English only to have a bright future . On the other hand, the 48 parents who believe the children are in fact Anglophones do not use the regional criterion but rather accentuate the cultural element (44%). They seem to accept ‘Anglophone’ as a system rather than an identity (13.5%) - although the difference between these two terms does not seem evident at all. Simply accepting that because the child speaks English perfectly s/he is Anglophone (42.5%) leaves many questions open: Could s/he also be Francophone simply because s/he speaks French perfectly? Questions like this one challenge any attempt to forcefully align these children on the Anglophone-Francophone identity formula. 4.4 How do these children call themselves? Among Francophone parents, to have a child who speaks English fluently is a great symbol of pride and an indicator of superior social rank. It does not, strangely enough, by any predictable means, teint the child with the stigma and stereotype often reserved for Anglophones. As shown above, the parents may refer to their children as Anglophones, but this only in the strict sense of the word - as someone who speaks English. The question is, do these children also see themselves as Anglophones? Are they actually Anglophones or are they Francophones? I posed them this question during interviews carried out in 2003 at the three nursery and primary schools listed in table 1. Below are excerpts of some of the interviews. Question: Are you Francophone or Anglophone? Child A: I am Francophone. Child A: Because my parents are Francophones. Question: But you speak English. Child A: Yes, I am Anglophone too. Question: So you are both? Child A: May be ... ... I don’t know. The semi-linguabrid child interviewed above considers herself a Francophone just because of her parents’ regional origin. On basis of her own linguistic performance she is unable to identify herself either as Anglophone or Francophone. Although she at one point imagines she could be both, the reality of being both does not seem to convince her, which perhaps explains why she concludes she does not know. The difficulty in clearly defining one’s official language identity, although this is the basic administrative, political, geographical and sometimes cultural basis of the classification of Cameroonians, indicates that a new identity, which is an amalgam of the two, has strongly taken root. The case is not different with the perfect-linguabrids, as the following excerpt shows. Child B: I am Anglophone. Child B: Because my mother is Anglophone. Question: And is your father Francophone? Child B: Yes. I am Anglophone and Francophone. Child C: I am bilingual [biliŋgwl], we are bilinguals. All children: We are bilinguals [biliŋgwls]. Child C, to whom the question was not posed, seems to realise that the mainstream classifications did not exactly capture them. He therefore proposes, "I am bilingual" which seems an accurate description of their linguistic status and mixed regional origin. The resounding echo from the other children "We are bilinguals" pronounced [biliŋgwls] places them in a similar identity definition situation. After being unable to identify themselves squarely as Francophone or Anglophone, they find the status of ‘bilingual’, which in fact captures their linguistic performance, an acceptable midway identity avenue. 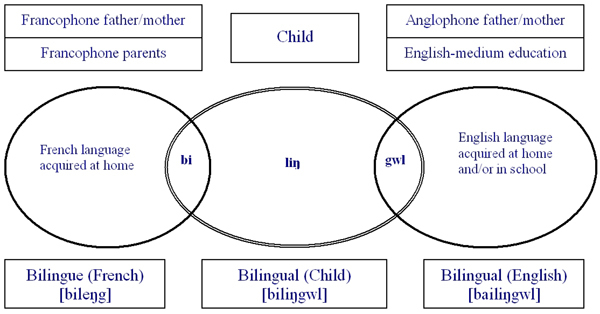 From an iconic point of view, the Francophone and Anglophone identities are represented in their pronunciation of the word ‘bilingual’ as [biliŋgwal]. The first syllable is pronounced in French and the third in English, even though the word has different forms in the two languages: French - bilingue [bileŋg] and English - bilingual [bailiŋgwl]. The second syllable [liŋ] is similar in both languages and is maintained by the children. The children are therefore the fruit of both identities, and this is most evident in their linguistic behaviour, hence the term linguabridity. Just as they bear parts of the two cultures in their birth - in the case of perfect-linguabrids, or in their pattern of education - as with semi-linguabrids, their pronunciation of the word ‘bilingual’, which they claim to be their identity symbol, also bears landmarks of the two cultures (anglophonism and francophonism). From the picture in figure 1, the children inherit bits from each parent (perfect-linguabrids) to construct an identity of their own or merge the Francophone culture predominant at home with the Anglophone culture present in school (semi-linguabrids) to produce one that is based on them both but is in itself complete, reflects them and their patterns of interaction. 5. Linguabridity at a higher level - or is it opportunism? At a higher level of education and with older Francophone students, there is a similarly strong appeal of English and for English language education (see Anchimbe 2005, Mforteh 2006, etc.). These students attended French-medium nursery, primary and secondary schools but now prefer to switch to education in English at the university or pursue English-taught degrees. From the statistics on table 4, many Francophones students are pursuing master’s degrees in the department of English, University of Yaounde I. In the 2001-2002 academic year, there were more Francophones (71.5%) than Anglophones (28.5%). Similarly more and more Francophone students apply for admission into the Anglo-Saxon University of Buea even though education there is exclusively in English. The issue therefore is, are these Francophone students some kind of linguabrids or are they simply involved in identity opportunism? It is important to signal, however that though pride in, and pragmatic necessity of, English are indeed involved, these students have the power to choose between the official language identity they want to portray. Their socialisation as Francophones has already inculcated in them the sensitivities of the group, from which they now only fluctuate for circumstantial purposes. They are therefore considered here as practising-linguabrids or trained-linguabrids - since they are already known to belong to one official identity and only practise or train themselves to belong to, or identify with, the other. They are motivated by the instrumental proceeds of knowledge of the language, which also happens to be a social rank marker. Linguabridity as discussed above is not simply the state of bilingualism in English and French. If it were so, then bilinguals in all societies would be linguabrids. It is not either the ability to adopt different identities together with the languages one speaks. It does not therefore refer to those who fluctuate in their identity attachment each time they switch from one language to the other. Fluctuation in this case means taking on completely the identity of the in-group of the language switched to. The linguabrids, except for the practising-linguabrids, do not switch consciously but nevertheless find themselves between the two official language identities, none of which fits them properly. If this trend should continue beyond the secondary schools, where it is now, to perhaps the professions, what would be the impact on the country, on the official language divide, on the sociolinguitic differences between Anglophones and Francophones? One thing seems clear: the policy of state bilingualism would be submerged in an individual bilingualism - and if this should happen, the strict definition of Anglophones and Francophones on basic linguistic commonality, would disappear as well. In the best scenario, Fonlon’s (1969) vision of having all secondary school graduates bilingual would come to pass. It would therefore necessitate a more national identity that no longer reflects regional origin but rather linguistic performance. Switching or identity opportunism would therefore be of no relevance since the peculiarities of convenience groups would have been shared nationally. Alobwede, D’Epie. (1998) Banning Pidgin English in Cameroon? In English Today 53, 14(1), 54-60. Anchimbe, Eric. (2004) Lexical markers of social (youth) group communication in Cameroon. In Proceedings of 4 th Postgraduate Forum on Linguistics. 1-8. Hong Kong: Hong Kong University. Anchimbe, Eric A. (2005) Anglophonism and francophonism: the stakes of (official) language identity in Cameroon. In Alizes: Rev ue Angliciste de la Réunion 25/26, 7-26. Anchimbe, Eric A. (2006) Functional seclusion and the future of indigenous languages in Africa: the case of Cameroon. In Mugane, J. et al. Selected proceedings of the Annual Conference on African Linguistics: African languages and linguistics in broad perspectives. 94-103. Boston, MA: Cascadilla Proceedings Project. Anchimbe, Eric A. (forthcoming) Hybrid linguistic identities in postcolonial Africa: the intricacy of identity opportunism in multilingual Cameroon. In Toro, De Alphonso and Frank Heidemann (eds.) New hybridities: Societies and cultures in transition. 211-235. Leipzig: Olms. Bird, Steven ( 2001 ). Orthography and identity in Cameroon . In Written Language and Literacy, 4 ( 2 ), 131-162 . Breton, Roland and Bikia Fohtung (1991) Atlas administratif des langues nationales du Cameroun. Yaounde/Paris: CERDOTOLA/CREA – - ACCT. Echu, George (2003) Coping with multilingualism: trends in the evolution of language policy in Cameroon. In PhiN 25, 31-46. http://www.fu-berlin.de/Phin/x/dir.cgi?ptest. Duodu, Kwasi (1986) The Language Problem. In People’s Daily Graphic 5, 1986, 3. Ethnologue : Languages of the world. http://www.ethnologue.com. Fishman, Joshua (1996) Summary and interpretation: post imperial English 1940-1990. In Fishman, J. et al. (ed.) Post imperial English. 623-641. Berlin: Mouton de Gruyter. Fishman, Joshua (1989) Language and ethnicity in minority sociolinguistic perspective. Clevedon: Multilingual Matters. Fonlon, Bernard (1969) The language problem in Cameroon. In Abbia 22, 5 – -40. Giles, Howard and Nikolas Coupland (1991) Language: contexts and consequences. Minton Keynes: Open University Press. Hogg Michael A. and Dominic Abrams (1988) Social identification: a social psychology of intergroup relations and group processes. London: Routledge. Kouega, Jean-Paul (1999) Forty years of official bilingualism in Cameroon: an appraisal. In English Today.15 (4), 38-43. Kouega, Jean-Paul (2002) Uses of English in Southern British Cameroons. In English World-Wide, 23 (1), 93-113. Moyo, Themba (2003) “ "The Democratisation of Indigenous Languages: The Case of Malawi ” ". In AILA Review 16, p26-37. Omoniyi, Tope ( 2003) Language ideology and politics: a critical appraisal of French as a second language in Nigeria. In AILA Review 16, 13-25. Simo Bobda, Augustin and Paul Mbangwana (1993). An introduction to spoken English. Lagos: University of Lagos Press.